Why should we be careful when we use the term “cyberspace” or capitalise the “i” in “internet”? That is the question I tackle in a piece I wrote that traces the history of the word ‘cyberspace’, and argues that it can be unproductive to apply in many contemporary settings. Graham, M. 2013. Geography/Internet: Ethereal Alternate Dimensions of Cyberspace or Grounded Augmented Realities? The Geographical Journal 179(2) 177-182. (pre-publication version here). The paper argues that many of the ways in which we discuss, imagine, and envision the internet rely on inaccurate and unhelpful spatial metaphors. In particular, the it focuses on the usage of the ‘cyberspace’ metaphor and outlines why the reliance by contemporary policy makers on this inherently geographic metaphor matters. The metaphor constrains, enables, and structures very distinct ways of imagining the interactions between people, information, code, and machines through digital networks. These distinct imaginations, in turn, have real effects on how we enact politics and bring places into being. The paper traces the history of ‘cyberspace,’ explores the scope of its current usage, and highlights the discursive power of its distinct way of shaping our spatial imagination of the internet. Graham, M., Andersen, C., and Mann, L. 2015 Geographical Imagination and Technological Connectivity in East Africa. Transactions of the Institute of British Geographers 40(3) 334-349. (pre-publication version here). 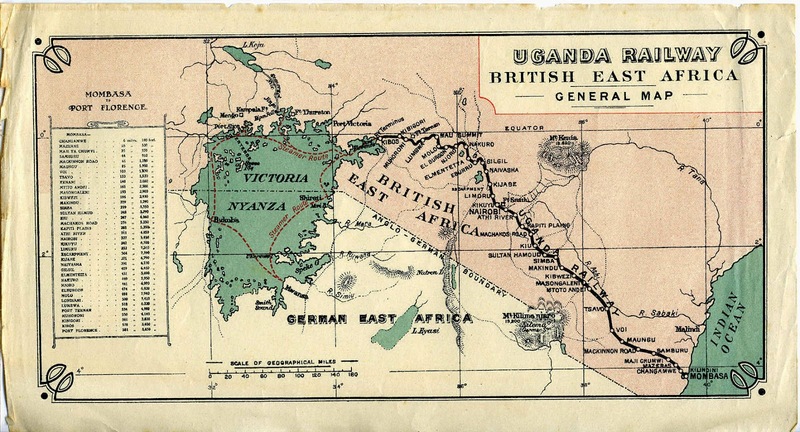 The paper analyses and compares two transformative moments of technologically-mediated change in East Africa, the construction of the Uganda railway between Mombasa and Lake Victoria (1896-1903) and the introduction of fibre-optic cables that landed into the ports of Dar Es Salaam and Mombasa in 2009. It uses discourse analysis to examine how technologically-mediated connectivity has been represented by political and economic actors during these transformative moments. In both cases, we explore the origins of the expectations of connectivity and the hope and fear associated with them. Building on Massey’s notion of power-geometry and Sheppard’s concept of positionality the paper focuses on power relationships in discussions of connectivity and asks how people understand the abilities of transformative technologies to modify positionalities and alter relational distance and proximity. Ultimately, by examining historical and contemporary expectations of connectivity in East Africa, this paper allows us to work towards creating more grounded and historicised understandings of the coming-together of technology and connectivity.